Millions of internal records have leaked from Britain’s offshore financial industry, exposing for the first time the identities of thousands of holders of anonymous wealth from around the world, from presidents to plutocrats, the daughter of a notorious dictator and a British millionaire accused of concealing assets from his ex-wife. 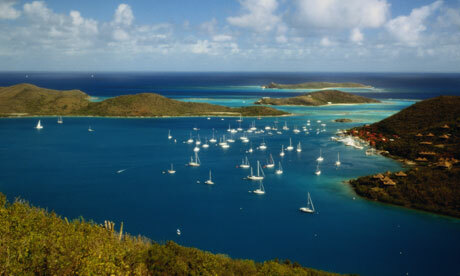 The leak of 2m emails and other documents, mainly from the offshore haven of the British Virgin Islands (BVI), has the potential to cause a seismic shock worldwide to the booming offshore trade, with a former chief economist at McKinsey estimating that wealthy individuals may have as much as $32tn (£21tn) stashed in overseas havens. In France, Jean-Jacques Augier, President François Hollande’s campaign co-treasurer and close friend, has been forced to publicly identify his Chinese business partner. It emerges as Hollande is mired in financial scandal because his former budget minister concealed a Swiss bank account for 20 years and repeatedly lied about it. In Mongolia, the country’s former finance minister and deputy speaker of its parliament says he may have to resign from politics as a result of this investigation. But the two can now be named for the first time because of their use of companies in offshore havens, particularly in the British Virgin Islands, where owners’ identities normally remain secret. The names have been unearthed in a novel project by the Washington-based International Consortium of Investigative Journalists [ICIJ], in collaboration with the Guardian and other international media, who are jointly publishing their research results this week. The naming project may be extremely damaging for confidence among the world’s wealthiest people, no longer certain that the size of their fortunes remains hidden from governments and from their neighbours. BVI’s clients include Scot Young, a millionaire associate of deceased oligarch Boris Berezovsky. Dundee-born Young is in jail for contempt of court for concealing assets from his ex-wife. Young’s lawyer, to whom he signed over power of attorney, appears to control interests in a BVI company that owns a potentially lucrative Moscow development with a value estimated at $100m. Another is jailed fraudster Achilleas Kallakis. He used fake BVI companies to obtain a record-breaking £750m in property loans from reckless British and Irish banks. As well as Britons hiding wealth offshore, an extraordinary array of government officials and rich families across the world are identified, from Canada, the US, India, Pakistan, Indonesia, Iran, China, Thailand and former communist states. The data seen by the Guardian shows that their secret companies are based mainly in the British Virgin Islands. • Jean-Jacques Augier, François Hollande’s 2012 election campaign co-treasurer, launched a Caymans-based distributor in China with a 25% partner in a BVI company. Augier says his partner was Xi Shu, a Chinese businessman. • Mongolia’s former finance minister. Bayartsogt Sangajav set up “Legend Plus Capital Ltd” with a Swiss bank account, while he served as finance minister of the impoverished state from 2008 to 2012. He says it was “a mistake” not to declare it, and says “I probably should consider resigning from my position”. • The president of Azerbaijan and his family. A local construction magnate, Hassan Gozal, controls entities set up in the names of President Ilham Aliyev’s two daughters. • The wife of Russia’s deputy prime minister. Olga Shuvalova’s husband, businessman and politician Igor Shuvalov, has denied allegations of wrongdoing about her offshore interests. •A senator’s husband in Canada. Lawyer Tony Merchant deposited more than US$800,000 into an offshore trust. He paid fees in cash and ordered written communication to be “kept to a minimum”. • A dictator’s child in the Philippines: Maria Imelda Marcos Manotoc, a provincial governor, is the eldest daughter of former President Ferdinand Marcos, notorious for corruption. • Spain’s wealthiest art collector, Baroness Carmen Thyssen-Bornemisza, a former beauty queen and widow of a Thyssen steel billionaire, who uses offshore entities to buy pictures. • US: Offshore clients include Denise Rich, ex-wife of notorious oil trader Marc Rich, who was controversially pardoned by President Clinton on tax evasion charges. She put $144m into the Dry Trust, set up in the Cook Islands. It is estimated that more than $20tn acquired by wealthy individuals could lie in offshore accounts. The UK-controlled BVI has been the most successful among the mushrooming secrecy havens that cater for them. The Caribbean micro-state has incorporated more than a million such offshore entities since it began marketing itself worldwide in the 1980s. Owners’ true identities are never revealed. Even the island’s official financial regulators normally have no idea who is behind them. The British Foreign Office depends on the BVI’s company licensing revenue to subsidise this residual outpost of empire, while lawyers and accountants in the City of London benefit from a lucrative trade as intermediaries. They claim the tax-free offshore companies provide legitimate privacy. Neil Smith, the financial secretary of the autonomous local administration in the BVI’s capital Tortola, told the Guardian it was very inaccurate to claim the island “harbours the ethically challenged”. He said: “Our legislation provides a more hostile environment for illegality than most jurisdictions”. Smith added that in “rare instances …where the BVI was implicated in illegal activity by association or otherwise, we responded swiftly and decisively”. The Guardian and ICIJ’s Offshore Secrets series last year exposed how UK property empires have been built up by, among others, Russian oligarchs, fraudsters and tax avoiders, using BVI companies behind a screen of sham directors. Such so-called “nominees”, Britons giving far-flung addresses on Nevis in the Caribbean, Dubai or the Seychelles, are simply renting out their names for the real owners to hide behind. The whistleblowing group WikiLeaks caused a storm of controversy in 2010 when it was able to download almost two gigabytes of leaked US military and diplomatic files. The new BVI data, by contrast, contains more than 200 gigabytes, covering more than a decade of financial information about the global transactions of BVI private incorporation agencies. It also includes data on their offshoots in Singapore, Hong Kong and the Cook Islands in the Pacific.